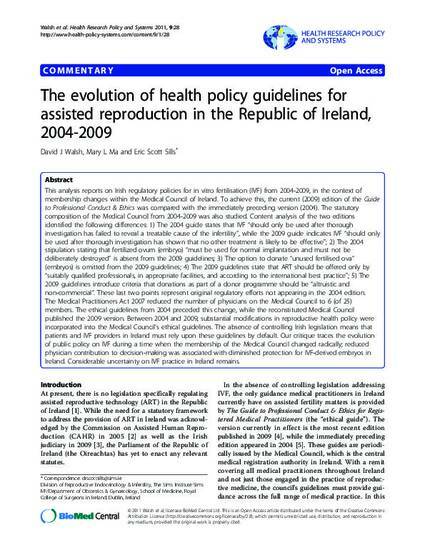 The evolution of health policy guidelines for assisted reproduction in the Republic of Ireland, 2004-2009. ABSTRACT: This analysis reports on Irish regulatory policies for in vitro fertilisation (IVF) from 2004-2009, in the context of membership changes within the Medical Council of Ireland. To achieve this, the current (2009) edition of the Guide to Professional Conduct & Ethics was compared with the immediately preceding version (2004). The statutory composition of the Medical Council from 2004-2009 was also studied. Content analysis of the two editions identified the following differences: 1) The 2004 guide states that IVF "should only be used after thorough investigation has failed to reveal a treatable cause of the infertility", while the 2009 guide indicates IVF "should only be used after thorough investigation has shown that no other treatment is likely to be effective"; 2) The 2004 stipulation stating that fertilized ovum (embryo) "must be used for normal implantation and must not be deliberately destroyed" is absent from the 2009 guidelines; 3) The option to donate "unused fertilised ova" (embryos) is omitted from the 2009 guidelines; 4) The 2009 guidelines state that ART should be offered only by "suitably qualified professionals, in appropriate facilities, and according to the international best practice"; 5) The 2009 guidelines introduce criteria that donations as part of a donor programme should be "altruistic and non-commercial". These last two points represent original regulatory efforts not appearing in the 2004 edition. The Medical Practitioners Act 2007 reduced the number of physicians on the Medical Council to 6 (of 25) members. The ethical guidelines from 2004 preceded this change, while the reconstituted Medical Council published the 2009 version. Between 2004 and 2009, substantial modifications in reproductive health policy were incorporated into the Medical Council's ethical guidelines. The absence of controlling Irish legislation means that patients and IVF providers in Ireland must rely upon these guidelines by default. Our critique traces the evolution of public policy on IVF during a time when the membership of the Medical Council changed radically; reduced physician contribution to decision-making was associated with diminished protection for IVF-derived embryos in Ireland. Considerable uncertainty on IVF practice in Ireland remains. Walsh DJ, Ma ML, Sills ES. The evolution of health policy guidelines for assisted reproduction in the Republic of Ireland, 2004-2009. Health Research Policy and Systems. 2011;9:28.